Sandy Cormack, a personal and organizational consultant, continues with his installments of Unlocking Creative Potential. He uses a neuroscience-based approach to team building, leadership development, creativity and innovation, change management, and business strategy development. As my regular readers know, I am a big fan of looking at various ways learning takes place, when and how training can be made most effective, and how we can unleash the best in all of us and those we train. Take a look again at Unlocking Creative Potential, this time from a group perspective. In the final installment we extend the discussion of individual creativity and explore the neuroscience of team creativity. Please refer to the two previous articles for basic left brain-right brain information and the model for whole brain creativity. 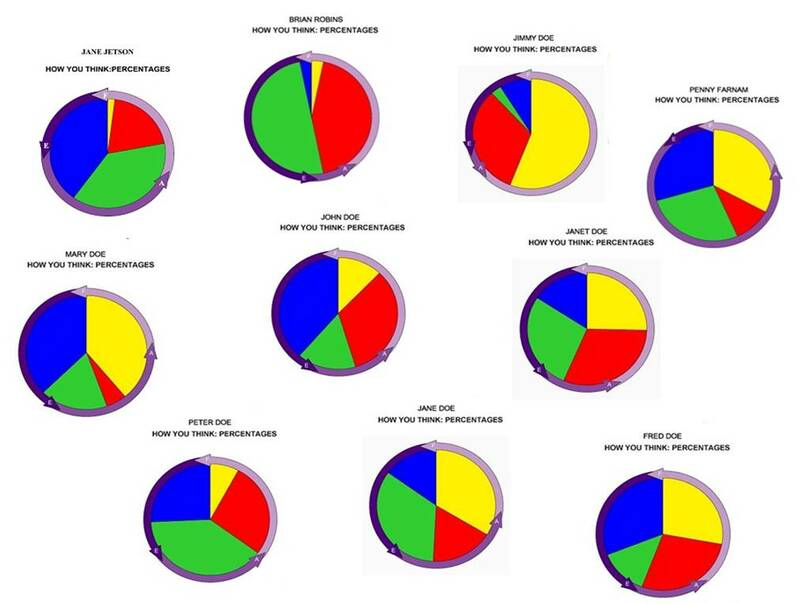 Between them, the team members share a “complete brain.” Each thinking preference is represented in at least one brain. Some have a preference for two attributes, some for three. But without proper facilitation and training, they probably won’t be able to leverage their collective creativity. They won’t function as a complete brain. This is mainly due to the fact that they likely don’t understand one another’s brains. Lacking this, they don’t understand one another’s strengths and weaknesses. Looking across the team, Fred has a weakness in an area that’s a strength for Peter (structural). Janet has a strength in an area that’s a weakness for Mary (social). Without team training, this group will likely regard these differences in a negative fashion. I see your weakness in structural thinking as a liability to the team instead of your conceptual thinking strength as a team asset. So we end up wasting energy on the problem that lies between us, rather than focusing it on the problem at hand. And that means we don’t get the best solutions. Team training is a natural progression from individual training. By participating in a team brain training workshop the individual first acquires self insight – a complete understanding of their brain preferences. From this they can move to self management – learning what they can do with this new understanding, acquiring new skills. The next step in the progression is team awareness: what does my group’s ‘collective brain’ look like? The final step is team development: how can we exploit our brain diversity? This four-step process is a model for general organizational development. 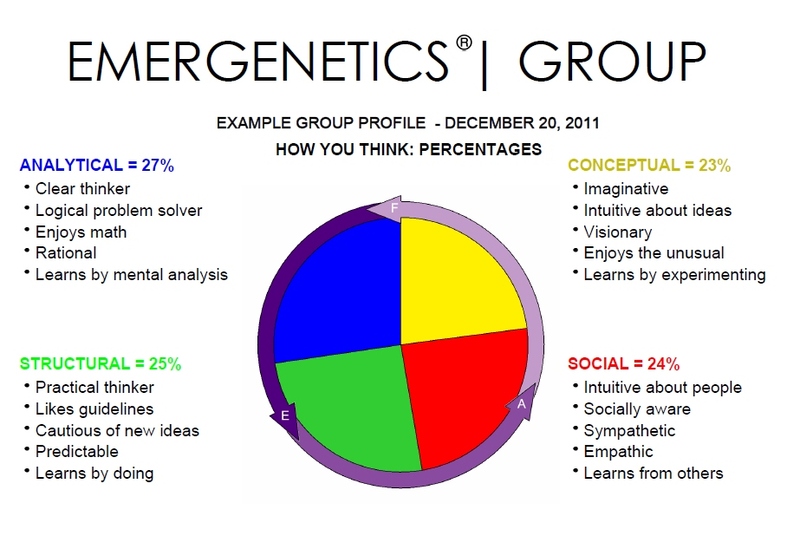 This excerpt from a ‘dot graph’ depicts not only the group ‘averages’ in all four thinking attributes, but also the range across the group for each attribute. 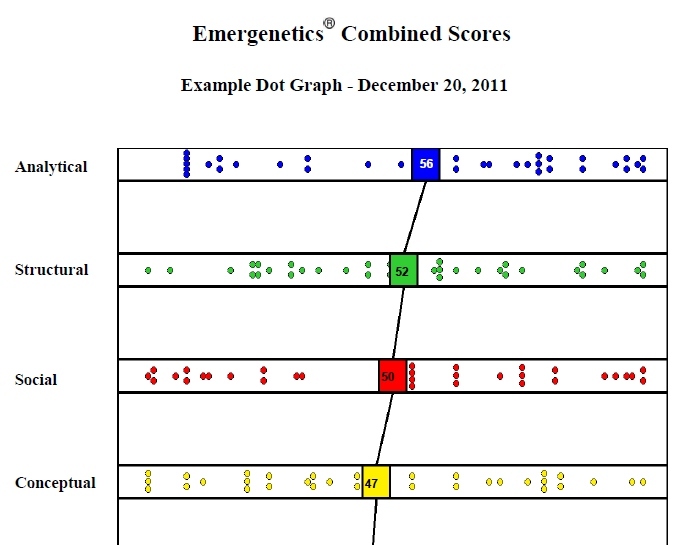 Each dot represents an individual’s percentile score in a particular attribute. The scores span the entire percentile spectrum. This is a dramatic depiction of the group’s mental diversity. It’s important that a team experiences this revelation collectively. When depicted in this fashion the team experiences their ‘collective brain’ for the first time and gains immediate understanding of their innate strengths – strengths they never knew they had. I now see your strength in conceptual thinking as a team asset, and will consider you an internal consultant in that area. Team members may naturally find themselves gravitating towards one of the four phases. 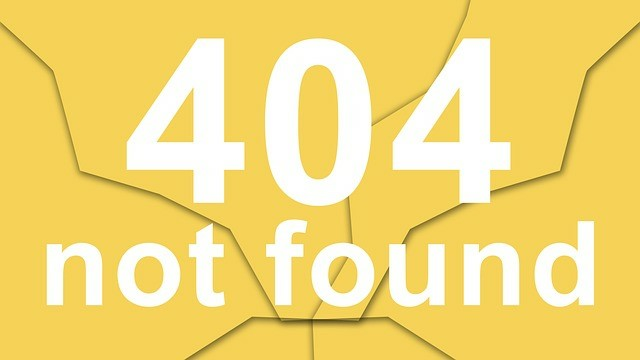 Analytical thinkers may be attracted to problem definition or solution selection. Conceptual thinkers may be attracted to ideation. But it’s important for all team members to learn how their preferences contribute to each phase. In problem definition, analytical thinkers research the problem and collect data to create a clear picture of the current situation. Structural thinkers consider processes and procedures as the likely source of the problem. Social thinkers define the problem after discussing it with others and gaining multiple perspectives. Conceptual thinkers create a clear vision for the future and contrast it with the current situation. In ideation, analytical thinkers take a systems approach and integrate the best aspects of multiple ideas. Structural thinkers draw upon what has worked well in the past and seek to improve. Social thinkers seek to understand best practices external to the organization. 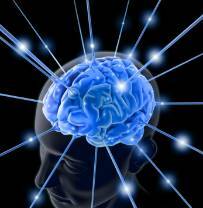 Conceptual thinkers intuitively proliferate transformational ideas. In solution selection, analytical thinkers use a cost-benefits approach, seeking to understand the pros and cons of each idea before selecting the best. Structural thinkers may tend to ‘short circuit’ this step and move immediately from ideation to implementation. Social thinkers consider the impact of the solutions upon people. Conceptual thinkers gravitate to the more strategic solutions that break structure. In implementation, analytical thinkers focus on performance measures so they can validate the solution. Structural thinkers take a leadership role and manage the process. Social thinkers ‘grease the skids’ by finding out how to mitigate the organizational impacts of the solution. Conceptual thinkers might not even get involved. By leveraging each thinking preference in each phase, the odds of finding the ‘correct’ solution increases dramatically. The group can intelligently determine the ‘right’ amount of change the organization can withstand. It can decide whether the solution should be more strategic or more tactical. It can better obtain the internal support needed to achieve success. And just by going through the process, the team members will develop skills in their areas of weakness as they learn from those for whom those areas are strengths. Conceptual thinkers will learn to appreciate the impact of their blue sky ideas on the people in the organization. Structural thinkers will learn the value of ‘slowing down’ to consider a wide range of alternatives. Social thinkers will learn the value of a cost-benefits approach. Analytical thinkers will learn to ask ‘what do you think about this’ when defining the problem. The foundation to all of this is the left brain right brain test. Taking it is the first step in unlocking your organization’s vast creative potential. My thanks to Sandy Cormack as my guest expert blogger for providing his view for “unlocking your organization’s vast creative potential.” It certainly deserves consideration and further study. As we all know, I am about generating ideas from wherever they come–so keep them coming. I’m always available through this site through your comments and my own website, where I talk about a few other things besides training and development. In this case, I leave it to you to make the connections. The field of creativity and how we go about unleashing it in individuals and groups is a vital part of our profession. Happy Training. By the way, you’ll all understand we have to make a living so I need to mention yet another approach to training and development. It begins–well, where it begins–with early man and how he learned to survive. My new ebook, The Cave Man Guide to Training and Development, takes a more basic look at our profession, along with a few related areas and looks at what we do (or don’t do) from various perspectives, sometimes the most basic: the trainee, the employer, the trainer or training manager.